Recent research performed by SCRI International has discovered that online video has now become leading video application among video professionals. The research was performed in conjunction with Broadcast Beat magazine through an annual survey. Since 1984, SCRI International, Inc., based in Florida, has been publishing annual syndicated and customized market research reports covering broadcast and professional video for equipment manufacturers, investment firms, trade magazines & associations, and other industry analysts, including the US. Department of Commerce. For more than thirty years, SCRI has been conducting industry surveys and producing reports on the broadcast and non-broadcast, pro video and digital content creations sectors in both multi-client, off-the-shelf, and single client customized format. SCRI Reports have been used by over 2,000 clients in the industry, including all of the major players, as well as the U.S. Department of Commerce. SCRI data has been quoted in many trade press and general news articles, including the New York Times. Global Niche Vertical Market & Technology Reports – detailed reports on niche market and key technologies facing the industry. List of reports and links to table of contents & pricing in table below. US Broadcast Pro Video Product Reports – tracks market size (units & dollars), vertical market analysis, growth patterns, forecasts, brand shares and analysis of major models for over 20 product types. According to an annual tracking survey among Broadcast Beat subscribers and social media (Facebook and Twitter) followers, online video is now the number one video application across the board of vertical user markets. Online video was ranked first among 19 applications with 48.9% of all respondents. In addition, “online webisonic content” garnered an additional 24.6%. So, when taken together, around seven out of ten facilities are engaged in online video. Industrials (corporate video), which used to rank first for years (according to SCRI tracking surveys from 1984 until recently), now ranks second with 40.5%, along with television (40.5%). In addition, training videos (39.4%), documentaries (38.7%), special event content (34.5%), and music videos (30.6%) are all key pro video apps. The survey was global with most respondents (76%) based in the US. Other regions included Canada (5%), Europe (12.6%), Asia / Pacific/Australia, and South America (1%) as well as the Middle East/Africa (1.3%). 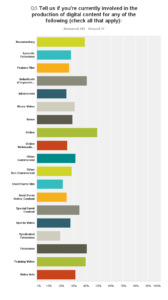 Video Production/Post is the primary industry type (59%) along with film production / post (28.6%). Almost nine out of ten facilities are involved in video / film production / post. Other key industry types include: broadcast TV (35.6%), media (31.7%), advertising (32.4%) and corporate/industrial video (33.8%). Of note is the emergence of home-based digital media production in the pro arena coming in at 27.6%. Of interest is the emerging democratization of the pro video industry with over half (55.6%) of all facilities are in the small (1-10 people) category. In terms of each of 18 industry websites pre-listed, more video pros reported visiting Broadcast Beat Magazine than any other (80.1%). Creative Cow was ranked next (69%), followed by MacProvideo(66.7%), DigitalProductionBuzz (64.4%), and Lynda.com (64.3%) rounding out the top five. The survey data is based on 302 qualified respondents, yielding a potential margin of error at the 95% probability level (in 95 cases out of 100) of between 1.9% – 5.8%. Data also includes a host of technology trend issues as well as brand shares for key product types. In a recent survey by SCRI among Broadcast Beat subscribers, a wide range of broadcast and pro digital video facilities were asked whether they were involved in the production of digital content for a long list of applications. “Online” emerged as the most common application with just under half of ALL responding facilities (45%) checking this application. Television (39%) and “video ads” (38%) ranked 2nd and 3rd, followed by “training videos” (35%) and “documentaries” (45%), rounding out the top five. NOte that the survey sample was comprised of a wide rage of vertical markets but primarily video production (41%) and broadcast (32%). The emergence of online video as the primary application has far reaching implications for manufacturers of hardware and software to this sector. According to SCRI’s annually updated (sine 1984) 2015-2016 Broadcast / Pro Video Marketplace Product Reports , the outlook for equipment budgets is somewhat less optimistic than for business revenues (as per prior post) with broadcast and pro video facilities cautious to spend until the economic upturn stabilizes. However, some vertical markets are more bullish than others (see below). One in four facilities (26.4%) across the board saw equipment budgets increase in 2013 – this rises to 36.4% in 2014 and 39% in 2015. In 2012, facilities across the board were relatively evenly divided between those that reported equipment budget increases, decreases or no change (31.5%, 29.3%, 30.9%). 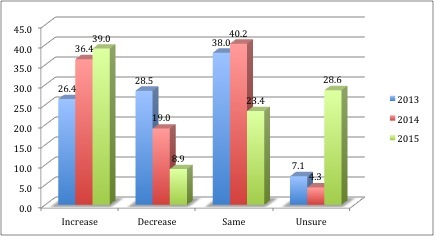 In 2013 more reported no change (43%) compared to increases (26.6%) or decreases (24.5%). Looking ahead to 2014, more facilities are expecting equipment budget increases (40.2%), 23.7% expecting decreases and 27.8% not sure at this time. Of note is the significant expected 2014 increase in equipment budgets among video & film production/post facilities, digital content producers, institutional and corporate video sectors – 37.1%, 53.6%, 39.5% and 37.5% respectively. These in contrast to broadcast TV (23.6%). SCRI has just released the 2015-2016 Broadcast Pro Video Trend and Product Reports, a syndicated research report series started in 1984 and updated annually for over 30 years. The Full Industry Trends Report is now available along with specific Product Reports covering 20 product categories and includes detailed quantitative analysis of market size ($ & units), by vertical market, growth by year and forecast (2014 – 2016) as well as brand shares. The Industry Trends Report also contains a compendium of secondary research on specific vertical markets and the rise of digital media in the industry. This report is provided free to those facilities that participated in the survey — to claim your report please respond to info@scri.com with Survey Report in the header and please use the email that you used when completing the survey for validation purposes. 4k/UHD Delivery to Clients – By When? Following up on last weeks post “4k/UHD – Hype or Reality” we add some new research data on expected time spans for delivery of4K/UHD to clients and also include some responses to last weeks article — we invite more responses to keep the discussion going.